Sean: Hi, master Yoda, can you offer some words of wisdom around leadership? Sean: So you mean like the force, you look at authentic leadership as an “ally”. Can you explain that? Yoda: A powerful ally it is. Life creates it, makes it grow. Its energy surrounds us… and binds us. Luminous beings are we, not this… crude matter! Sean: Ok, authentic leadership is energy like the force? No way, don’t believe you…..
Sean: Hmmm I wonder if you are right ….it is a very different way of looking at it. Yoda: Only different in your mind. You must unlearn what you have learned. Sean: But isn’t there a dark side to leadership too, just like the force? Yoda: Beware the dark side. Anger, fear, aggression. Easily they flow, quick to join you in a fight. If once you start down the dark path, forever will it dominate your destiny. Sean: I recognise this master Yoda…..those mood hoovers and naysayers, right? Those that dwell on the negative. So how will I know who is an authentic leader or when I will achieve this? Sean: That’s quite interesting. So as you said to me before, an authentic leader is a person who chooses to live a life of integrity. They are not only honest in relationships with others but most importantly they are honest and true to themselves. Does this mean they don’t make mistakes? Of course they do…we are all human! Well some of us Master Yoda…..and yet they have the courage to take responsibility for their ways, learn and grow. Why? Because they care! They care about people. Our Jedi mate Bill George says ‘the authentic leader brings people together around a shared purpose and empowers them to step up and lead authentically in order to create value for all stakeholders’…..and so, if I found my authentic leadership, being calm and at peace with myself, what should I be using it for? Yoda: For knowledge and defense, never for attack. Sean: Ok. Not sure about the defense bit master, but agree around the attack advice…..Yoda, there’s a lot of talk out there about being a big charismatic leader, some say being a big hero is important and is what makes people follow you. What’s your take on that? Yoda: Size matters not. Look at me. Judge me by my size do you? Sean: Would I dare, Master Yoda. So how should I use authentic leadership to get the best from my team? Yoda: Decide you must how to serve them best. A Jedi must have the deepest commitment, the most serious mind. Sean: What you are saying is I need to adopt the Jedi mind set, that is going to be hard….. You are saying I must learn to serve my team rather than them serving me…. I will try my best Master Yoda. Yoda: No! Try not. Do, or do not. There is no try. Yoda: Always with you it cannot be done. Hear you nothing that I say? Sean: Sorry, I will make the change Master. 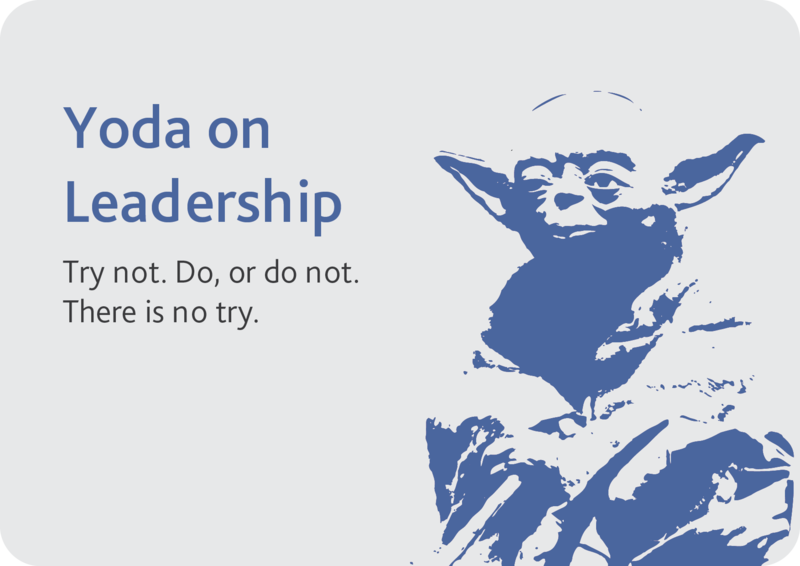 A lesson in leadership by Master Yoda! This entry was posted on December 6, 2011 at 4:10 pm and is filed under Blue Sky General, Leadership, Management Development, Training & Development. You can follow any responses to this entry through the RSS 2.0 feed. You can leave a response, or trackback from your own site. An excellent way to put across some great lessons. Enjoyed reading – thanks!